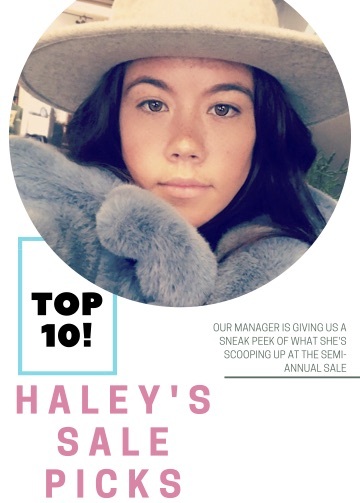 Haley's Top Ten Sale Picks! We're always interested in what the shopgirls are wearing/lusting after from our favorite stores, so we thought we'd take some time to show you what we're purchasing at the Semi-Annual Sale this weekend! DROP EVERYTHING -- Our Favorite Cardigan Is Back In Stock!! If you aren't yet familiar with our favorite USA-made basics line, Joah Brown, you're already missing out! SUPER soft, amazing, and available nearly exclusively in our favorite colors--BLACK, WHITE, and GREY. Okay, maybe they throw the occasional "pop of color" in there (currently, Apricot and Taupe) but we won't hold it against them.